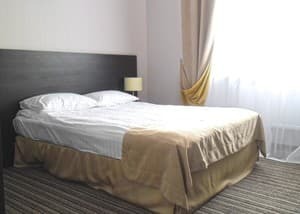 Hotel "Ukraine" is located in the center of the city Sumy, in historical, cultural and business center. Convenient to transportation, allows access without any problems from a hotel to any part of the city (to the train station, bus station, exhibition centers and other business enterprises - the objects) by public and by personal transport. Description of the room: Room size: 18,5-21 sq.m. In the room: 2 single beds (900 * 2000) with orthopedic mattresses, refrigerator with minibar, TV, cable TV, telephone, Wi-Fi, bathroom with shower, slippers and mini-haberdashery (on request). Description of the room: Room size: 15,8-23 sq. M. In the room: 2 single beds (900 * 2000) with orthopedic mattresses, work desk, bedside table, mini bar, mini-safe, TV, cable TV, telephone, Wi-Fi , bathroom with shower or bath, hair dryer, air conditioning. Description of the room: Room size: 17 sq.m. In the room: 1 single bed (900 * 2000) with orthopedic mattress, refrigerator with mini-bar, TV, cable TV, telephone, Wi-Fi, bathroom with shower, slippers and mini-haberdashery (on request). Description of the room: Room size: 14.6 sq.m. In the room: 1 queen-size bed (1400 * 2000), bedside table, TV, cable TV, telephone, Wi-Fi, mini-bar, mini-safe, bathroom with bathtub, hairdryer, air conditioning. 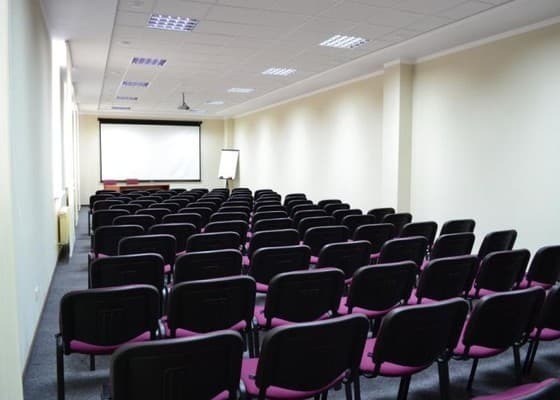 Description of the room: Room size: 21,9-27 sq. M. In the room: 2 single beds (900 * 2000) with orthopedic mattresses, desk, bedside table, armchairs, mini bar, mini-safe, TV, cable TV, telephone, Wi-Fi, bathroom with bath, hairdryer, air conditioning. Description of the room: Two-room suite Room area: 39-55 sq.m. 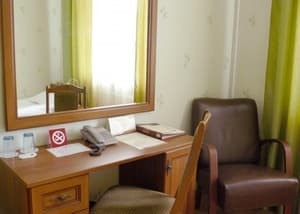 In the room: 1 double bed (1600 * 2000), TV, cable TV, Wi-Fi, refrigerator with minibar, radiotelephone, safe, air conditioning, bathroom with shower, slippers, a set of towels for two guests, hairdryer, mini-haberdashery, balcony (in some rooms). Description of the room: Room size: 48,5-52,4 sq. M. In the room: two rooms, 2 single beds (900 * 2000) with orthopedic mattresses, work desk, bedside table, armchairs, coffee table, mini bar, mini-safe , TV, cable TV, telephone, Wi-Fi, bathroom with bath and bidet, hairdryer, air conditioning. Неплохая гостиница все чистенько отзывчивый персонал. Приличный отель, хороший континетальный завтрак (шведский стол), отличный персонал. Нет отдельной охраняемой парковки (просто под отелем). во время вселения не обнаружилось моё бронирование, которое я заказывала по интернету, но персонал быстро решил эту проблему. - удобное расположение; - наличие гостиничного паркинга; - приветливый персонал; - чистота. - wf работал только в лобби; - вечером словами иностранного гостя - everything is closed, негде было купить воду. Впринцыпе гостиница не плохая, после проживания в ней отрицательных эмоций не было. Порадовало соотношение цена/качество, и очень удобная развязка. В ванной не хватало банных принадлежностей (шампуни, мыла). Children`s bed is given to children under 2 free of charge. For children under 6 there is a possibility of free accomodation with parents who pay for the whole room. In the building of the hotel "Reikartz Sumy" with a separate entrance from the street there is a grill-bar, a restaurant of Ukrainian cuisine and a seasonal summer area in front of the hotel. In the centre of Sumy.